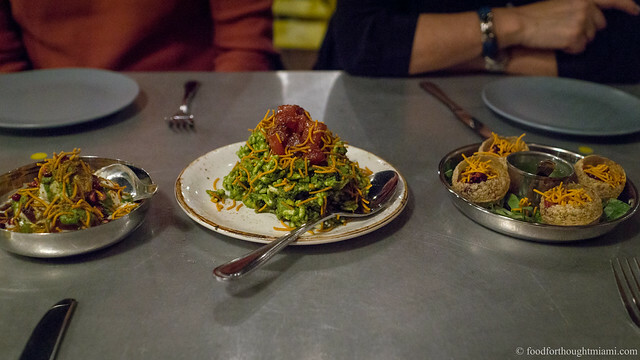 I wrote about my initial visit to Sakaya Kitchen about a month ago. 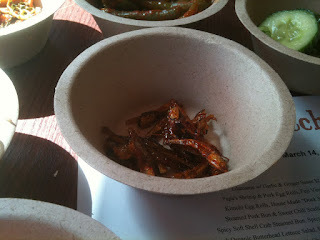 Chef Richard Hales' focus on Korean flavors, organic ingredients, and reasonable prices all showed real promise. 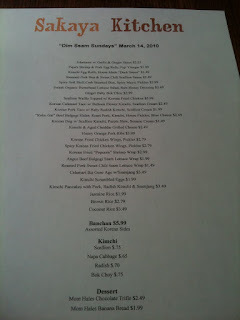 That promise is fulfilled, and then some, with Sakaya's "Dim Ssam" brunch, which was unveiled this weekend. While the restaurant is set up for counter service, Chef Hales has switched over to table service for the brunch, and has crafted a longer menu of smaller-portioned dishes that play on his contemporary Korean theme (thus, "Dim Ssam"). I was just about the first person knocking on the door a little after 11am this past Sunday to give it a try. Choosing was not easy. Fortunately, the prices are so reasonable that you can try a sampling of several items without breaking the bank. Everything I tried was excellent. 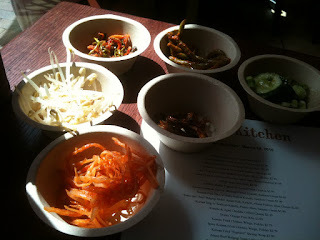 "Banchan" are a customary feature of Korean dining, a selection of little side dishes to accompany a meal. 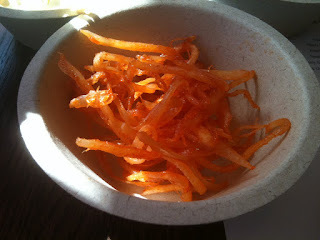 Different types of kimchi are typical, but usually there are a variety of other items as well. At Sakaya, ordering the banchan (for $5.99) brought seven dishes, including dried shredded cuttlefish ("ojinguh bokkeum"), bean sprouts dressed in sesame oil ("kongnamul"), tiny dried anchovies ("myulchi bokkeum"), pickled cucumbers, green bean kimchi, balloon flower root kimchi (a/k/a bellflower, or "doraji"), and marinated tofu. 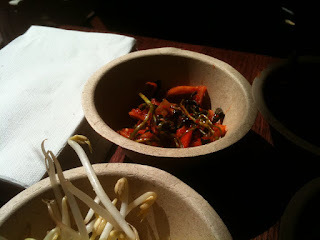 These ranged from extremely pungent (the anchovies) to very spicy (the balloon flower root kimchi) to sweet-sour (the cucumber pickles) to sweet-spicy (the dried cuttlefish) to mild (the bean sprouts and tofu), and each with a different texture as well. It's a great way to wake up the palate and reinvigorate it between bites of heartier stuff. Just keep a beer close by. 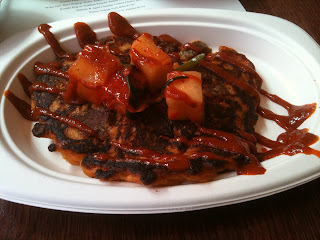 With prices for just about everything at around $3 or under, I tried several of the menu items, starting with the Korean Pancake with Pork, Radish Kimchi and Ssamjang. This is no flapjack, but rather a version of the Korean savory pancake called "pajeon," and to me it bears more than a passing resemblance to the Japanese okonomiyaki. The pancake is made from an eggy batter thickened with flour, and here, studded with bits of savory pork, cooked all nice and crispy on the outside. 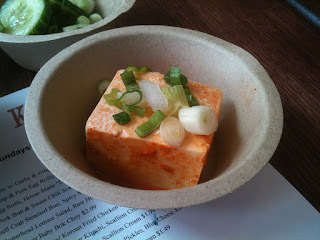 It's topped with cubes of daikon radish kimchi and then generously slathered with a smoky, spicy brick-red ssamjang sauce. This should be the Korean delegate to the International House of Pancakes. This may look a little more like the kind of brunch many folks are accustomed to - until they taste the kimchi in their scrambled eggs. This was recommended by my server (incidentally, everyone in the restaurant did a great job of handling their first day of table service, along with a mostly new menu) and it was a good call. 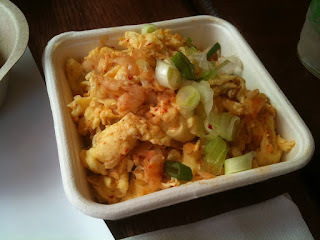 The kimchi added a nice spice note and textural interest to the scrambled eggs, which happened to be great scrambled eggs - nice tender curds, not too dried out, but not runny. I'm not one to get excited over scrambled eggs, but even without the addition of the kimchi, these would have been delicious. 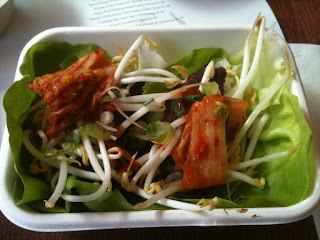 I rounded things out with an order of the beef bulgogi ssams (a "ssam" is a lettuce wrap). Chef Hales uses Angus beef for these, and it's given a savory marinade and grilled, then folded into lettuce leaves with some rice, bean sprouts, and kimchi, along with a splash of ssamjang. It's a great combination: the beef is flavorful with just a hint of sweetness to the marinade, and a good balance of tenderness to meaty chew; the bean sprouts and lettuce give lightness and crunch; the rice gives a bit more ballast to the package; and the kimchi and ssamjang give a one-two punch of heat and spice. 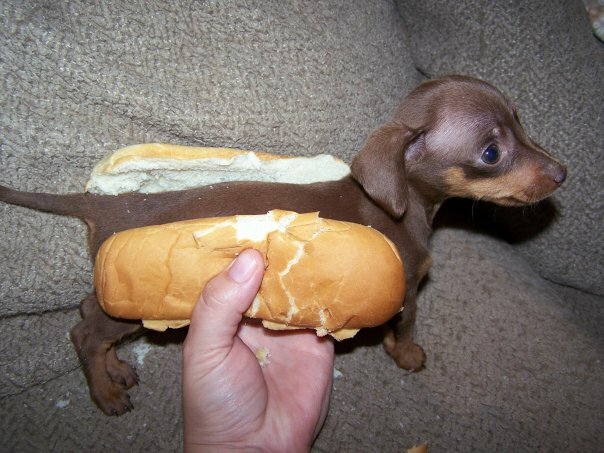 Somehow, a "Korean dog" also made its way to my table, though I didn't remember ordering it. Not complaining, of course: like a mini-dachshund tucked into a bun, this half-size hot dog was folded into a short bun and topped with vibrant purple slaw, some pungent scallion kimchi and a bit of sesame cream to help it all down. Good stuff, and even if it wasn't quite on the same scale as gastroPod's "Old Dirty Dawg," it can more than hold its own in its weight class (and only $1.50!). Still and yet, I may have missed some of the best stuff on the menu. I heard raves coming from other tables for the scallion waffle topped with Korean fried chicken, as well as the soft shell crab steamed bun. I ended up seeing plenty of the local fooderati there - @epicuriouschic, @lax2mia, @romanforum - and several others apparently showed up later. Seems everyone came away impressed. Chef Hales indicated they might eventually start doing table service in the evenings as well, and late-night service is potentially in the works too. I spent some time talking to Chef Hales before the crowds came in, and it's always such a pleasure meeting someone who is so passionate about their craft. He credits his one-time boss, über-chef and restaurateur Jean-Georges Vongerichten, with some of the inspiration for Sakaya Kitchen, and in particular the idea of doing real, serious cooking in a simple, no-frills venue. It seems everywhere you turn, including here in Miami, people are talking about the death of fine dining (though some might say it's never really been alive in South Florida). While that's probably an exaggeration, I think places like Sakaya Kitchen, which focus on the quality of their ingredients, do their cooking from scratch, and give their diners bold, exciting flavors at a good value by skipping the huge investment in spaces that look like mansions or ultra-lounges, may well be the next wave. I hope so. 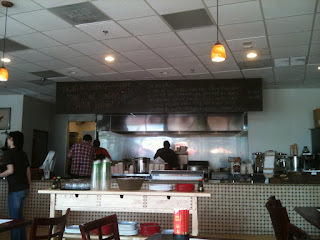 My husband and I so enjoyed their first dim ssam brunch too, thnx to your tweet. Finally, a place that serves good Asian food at reasonable prices. Congrats Chef Richard. BTW, orange is my fav color, you've made it fun in there. Damn... Now I've really gotta get over there and pronto. What time do they close? Nevermind, I went to the website. Dim sum is delicious, and I didn't think that Miami had any good spots. I'll certainly go there and review it on my blog. Good to hear! Can't wait to get over there, thanks for the review and comments!